Trip Barnes (left) and Ross Gannon swap tales on makeshift porch stage at Creative Living Award event Monday at the Ag Hall. In 1983, the Ruth J. Bogan estate presented the Permanent Endowment for Martha’s Vineyard with a $60,000 gift to establish the Creative Living Award, given annually to one Island resident who embodies the fiercely creative, courageous and independent spirit of Ms. Bogan in her contributions to Island life. Over the past three decades, the award has gone to Island artists, musicians, craftsmen, doctors and naturalists. In a rollicking, funny and poignant event at the Agricultural Hall on Monday night the award went to a truck driver. And truck seller. And the only man on Martha’s Vineyard who can move a grand piano to Grand Rapids, an ottoman to Ottawa and an 180,000-pound house two blocks up Main street in Vineyard Haven. And please don’t ask if he has a permit. The man of course is Clarence A. (Trip) Barnes 3rd. “Before we do anything, we have to correct something,” Mr. Barnes’s cousin Billy McCullough told a packed house at the West Tisbury Ag Hall. “And what’s that?” said Emily Bramhall, executive director of the Permanent Endowment. 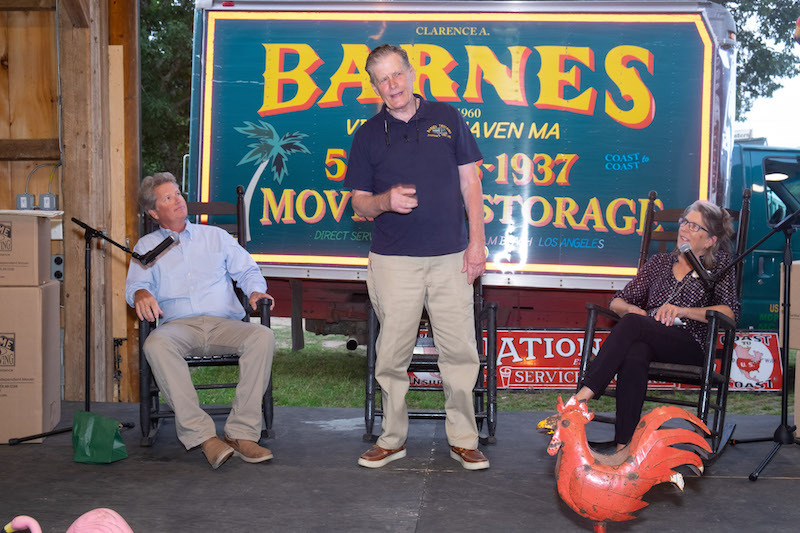 Mr. Barnes, whose business Barnes Moving and Storage is just as much of an Island institution as the 75-year-old himself, spurned his Park avenue, prep school childhood to make a life on the Vineyard. He worked as a milkman, became friends with the right people (and some of the wrong people), found money where there was none and started a business doing what he loved: moving as many hearts, minds, and occasionally, as much furniture as he could. He’s hosted auctions as unfiltered as the Camels he smoked and spent decades as the ire of lawmakers, bartenders, ferry workers, building inspectors and teetotalers. Yet through the years, Mr. Barnes’s timeless red, green and yellow-painted 18-wheelers, styled more like they were meant to transport P.T. Barnum’s savannah predators than Allen Whiting’s artwork, became omnipresent Island totems of the equally colorful spirit and character of their driver. 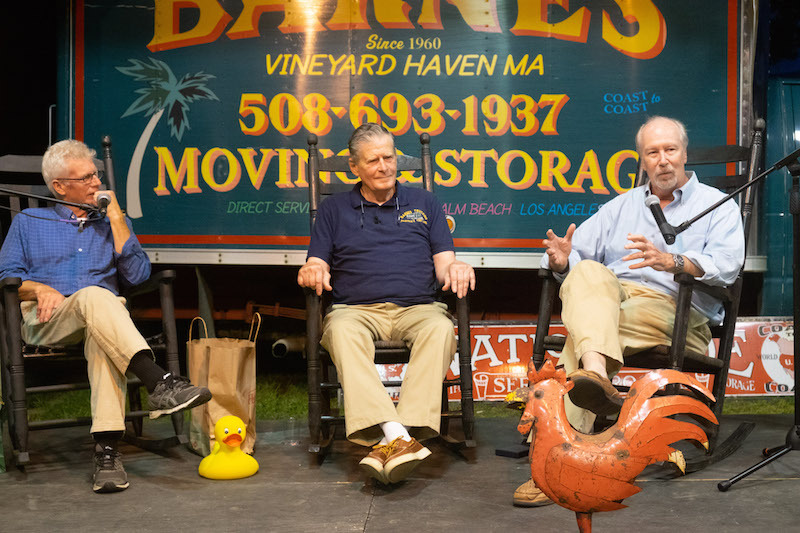 On Monday night as the Permanent Endowment transformed the Ag Hall into Trip Barnes’s porch, equipped with rocking chairs and his plaster dummy, lifelong friends told stories about the lives Mr. Barnes had not only touched but often saved. She was right. As the packed house listened to the evening’s hilarious porch stories, many couldn’t help but realize that Mr. Barnes was responsible for the barn they were sitting in too. 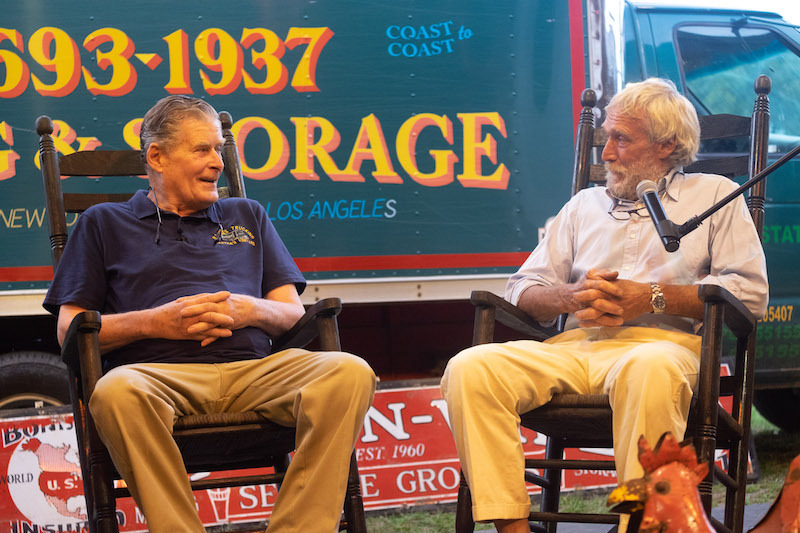 As a youngster in the 1970s, Mr. McCullough recalled he had the privilege of riding shotgun with Mr. Barnes while he completed the heretofore unprecedented New England grocery tour for Cronig’s Market. Between stories of sinking ferries, saloon shootouts, forgotten permits and other yarns about all the fun Trip had in his life, everyone on stage agreed that Mr. Barnes was also one of the hardest workers they knew. His can-do ethic extended beyond his own ability to lift a refrigerator up a five-story Manhattan townhouse; he expected a similar devotion from his employees, many of whom were down-and-outers who came to Mr. Barnes as a last resort. Before he helped start the Island’s sober living facility, Vineyard House, Mr. Barnes unofficially provided a similar service in his upstairs loft. Allen Whiting, a former recipient of the Creative Living award, congratulated Mr. Barnes on his own sobriety. “It’s why I’m here today,” Mr. Barnes said. When neighbors of the proposed Vineyard House began to express fear about the project at selectmen’s meetings, Mr. Barnes came up with a foolproof way to quell their concerns. Mr. Whiting described “the Anthony Bourdain of the highway” as a natural fixer. When Mr. Barnes inherited a barn that was too small to store his hefty collection of wares, he decided to simply lift the thing higher. Mr. Barnes raised money almost as well as he raised buildings. Chris Scott, former executive director of the Preservation Trust, said Trip had brought in more than $5 million auctioneering for the Trust alone, using phrases like “you’re my new best friend,” and “tie me to a tree and call me stupid,” to sell bird cages for $10,000, and Ray Ellis paintings for $250,000. Mr. Barnes would sell seats on a broken-down school bus for $1,000. He’d turn it into a tour bus, taking passengers to parts of the Island they’d never seen. One time he brought all 44 passengers into David McCullough’s house on Music street and started juggling the author’s two Pulitzer Prizes. Mr. Barnes called it the Magical Mystery Trip. Mr. Scott recalled the memorable night Mr. Barnes decided to sell Ray Ellis’s tie at the end of an auction. Trip sold the tie for $150,000 but the buyer gave it back to Ray Ellis. When Mr. Ellis died, his wife Teddy gave it to Mr. Scott. On Monday, with tears in his eyes, Mr. Scott presented the $150,000 tie to its original seller, Clarence Barnes 3rd. Although Mr. Barnes has moved all over the country, he’s always been rooted himself on the Vineyard. “I never wanted to live anywhere else,” he said. “I’ve been to every state in the Union except Hawaii probably five times and maybe more, and they’re all fun to visit, and I’ve even wanted to go back to one or two of them, but this is where I live and I love the people here and I love the Island. The biggest embellisher in the whole family! Trip can weave a tale that no other can! Love him and I greatly admire him! What a great story about a true original. What a great night with so many family and friends! Wonderful character. Never had any idea he did all the charity work mentioned and much more I gather. Used him numerous times to move everything from a boat in Ft Lauderdale to a new appliance, or two, from a local off island vendor. The crews were always great guys. Best wishes for a wonderful 'retirement'. Fabulous account of a richly lived life. Whenever I see a Trip truck in Boston, I always feel a thrill for the home team! Trip and Company moved my wife and I off the island 6 plus years ago. I would have him move me again. So sorry to have missed this bash of a lifetime. Or, bash about a lifetime. Or, about the first part of a lifetime. The next phase will also be a wonderful bash, I am sure. I wish you, Trip, the best possible trips to come, starting with Yurp. They won't know what hit them! Viaggi felici! The Permanent Endowment is accepting nominations for the 2018 Creative Living Award.